SINGAPORE – Kiefer Ravena said all of the three gold medals he won in the Southeast Asian Games were sweet there is something about this year that set it apart from the two others. Shortly after he won what could be his final gold medal in the biennial meet following Gilas Cadets’ 72-64 win over Indonesia on Monday night, Ravena declared said this one as entirely different. Ravena and the rest of the Filipinos had to sweat it out for the gold as they had to scramble past Thailand in the semifinals to win, 80-75, after overcoming a 10-point halftime deficit. 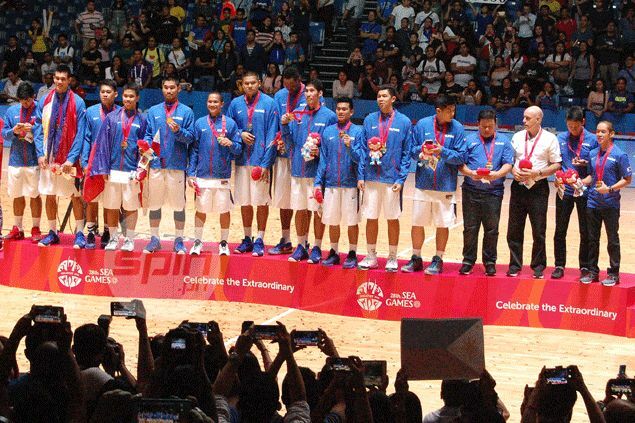 The gold medal match was no different as the Philippines had a hard time putting away a stubborn Indonesian side which was reinforced by players from the Asean Basketball League (ABL). For Ravena, the win was a far cry from the two previous national teams where he played and won the SEA Games gold in the 2011 (Palembang) and 2013 (Myanmar) editions of the biennial meet. “We were able to win big during those two previous SEA Games. But this one was really competitive,” Ravena said. The son of former national players Bong and Mozzy Ravena though the Philippines’ neighboring countries began to close the gap during the Palembang SEA Games. “Nakita nung mga teams na yung 26th SEA Games, eto ‘yung gauge namin. Pinaghandaan talaga nila kami. Hindi naman kami nagpabaya,” said Ravena, who even threw his pair of shoes to the crowd to celebrate his latest biennial meet gold.